The floors might not look amazing yet (that's wood filler all over them, which will be mostly removed during the final sanding), but give the hardwoods another couple of days and they will be stunning! Our floors are fir and 104-years-old and over time they've been splattered with paint, covered in carpets, and generally shown no love. So I couldn't be happier to revive these beauties! They deserve it. Stay tuned next week for the finished product. Speaking of the next week, I'm going to be cleaning up my vintage theater seats (I shared a picture of them over on Instagram). I haven't quite decided if I'll strip the paint from the arm rests or leave them green. Either way, I'm pretty excited about them. Sometimes when I talk about vintage theater seats, people look at me kinda funny, so I wanted to share my vision with you guys. Cool, right?! The vintage theater seats I found were pulled out of a middle school in Tacoma, WA and date back to the 1940's. They were a good price, so I bought a few extra sets thinking I could use them elsewhere at the Farmhouse and/or for a client project we're working on. Needless to say, you'll be seeing a lot of them on the Grit and Polish for the foreseeable future. One thing I haven't been quite so decided on for this room is art. I always struggle with choosing art at the end of a renovation. Give me an entire kitchen remodel to do in 7 days and I'm good, but when it comes time to pick art and pillows, I hem and haw for months. Of course I don't have months left on this project, so I'll be making my final choices soon. One piece of art we know we want is a print for the large wall across from the bed. We're imagining something that you can get lost in while you fall asleep. sources: 1. "New Beginning" by Kai Samuels-Davis | 2. 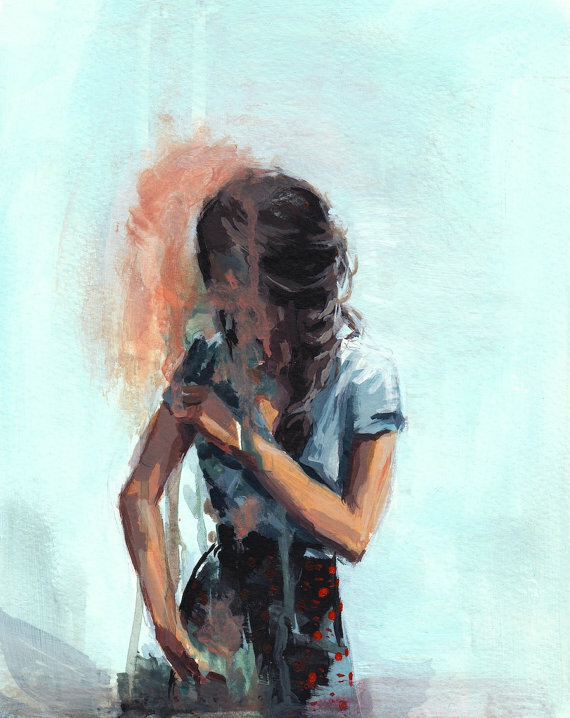 "Mornings Away" by Emily Jeffords, Minted | 3. "First Frost" by Lou Wall, Costco | 4. "To Pieces" by Clare Elsaesser, Etsy | 5. "Mother Embrace" by Kate Ahn, Minted | 6. "Disguise" by Clare Elsaesser, Etsy | 6. "Scenic Droplet" by Isabella Burton, Anthropologie. My favorite is number 4 and Garrett really likes number 1. What do you guys think? Any prints stand out to you? Or better yet, any other recommendations for art? In case you missed them, here are my ORC posts from Week 1 and Week 2.
p.s. The anti-helicopter parent. This is sooooo Garrett, minus the seemingly sexist tone and the roof thing. p.p.s. did you guys catch this home tour on coco+kelley this week? I've been back to look at it three times already - it's just so good! p.p.p.s. I'm excited to read Chip and Joanna's book. Has anyone read it yet? I'm dying to hear what you thought!